Potent, selective and non-competitive NMDA receptor antagonist (Kd = 37.2 nM). Approx 10-fold more potent than (-)-MK 801 maleate. Prevents calcium ion influx and long term potentiation induction. Shows anticonvulsant and neuroprotective properties. 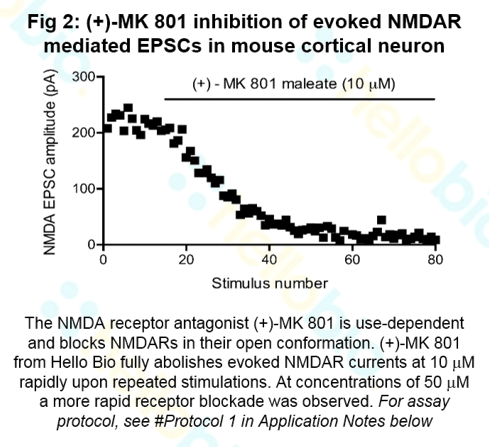 The NMDA receptor antagonist (+)-MK 801 is use-dependent and blocks NMDARs in their open conformation. 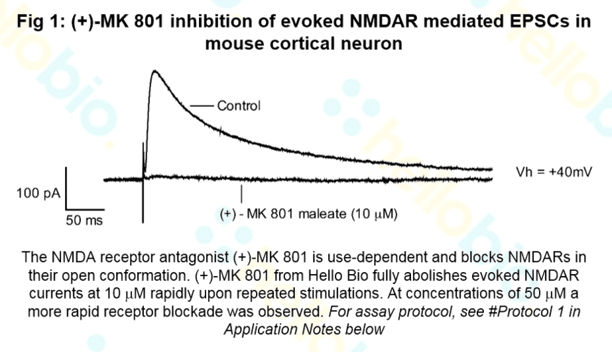 (+)-MK 801 from Hello Bio fully abolishes evoked NMDAR currents at 10 μM rapidly upon repeated stimulations (see Fig 1 above). At concentrations of 50 μM a more rapid receptor blockade was observed. NMDA currents were evoked via a stimulating electrode placed in layers II/III and evoked by a single square (150 μs) pulse every 10 sec at a stimulus intensity that gave a reliable NMDA current. Neurons were held at +40 mV to relieve NMDA currents from their voltage-dependent Mg2+ block. NMDA currents were continually stimulated and recorded in response to continual bath applications of (+)-MK 801 until NMDA currents were completely abolished. Effects of MK-801 stereoisomers on schedule-controlled behavior in rats. Genovese RF et al (1991) Psychopharmacology (Berl) 105(4) : 477-80. The effects of dizocilpine maleate (MK-801), an antagonist of the N-methyl-D-aspartate receptor, on neurologic recovery and histopathology following complete cerebral ischemia in primates. Lanier WL et al (1990) J Cereb Blood Flow Metab 10(2) : 252-61. MK-801 blocks NMDA receptor-mediated synaptic transmission and long term potentiation in rat hippocampal slices. Coan EJ et al (1987) Neurosci Lett 80(1) : 111-4. Wong EH et al (1986) Proc Natl Acad Sci U S A 83(18) : 7104-8. The following papers have cited the use of (+)-MK 801 maleate (HB0004) from Hello Bio. If you have published a paper using this product, and it is not shown here, then please tell us! We will send you a free gift as a thank you! Desensitized D2 autoreceptors are resistant to trafficking. Excellent. We are using MK801 in our research. We are very satisfied with the quality of this product. Good delivery. 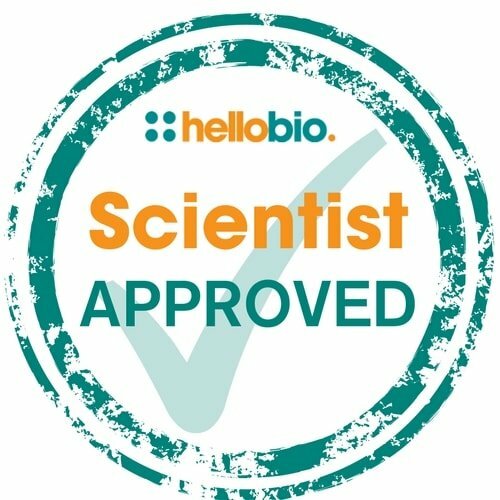 We, in Canary Islands, have a lot of problems with the deliveries: customs and orders that are months late; however, our first order with Hello Bio, has been satisfactory. The (+)-MK 801 Maleate has arrived in only some days and it was in perfect conditions. (+)-MK 801 maleate does what it should! It is a very good product, delivered very rapidly.